Compiled and contributed by John Gerdtz with thanks to BCCA Historian, Eric North for “The South Australian Motor” material. Also a very special thank you to Geoff Heaps from South Island, New Zealand for the time and trouble taken in researching and contributing the many 1925 New Zealand press reports and other N.Z. material about this event. Our pioneering motor companies were marvels at promoting their products via action stunts, mountain climbs, speed and endurance runs and pitching their products against the odds. 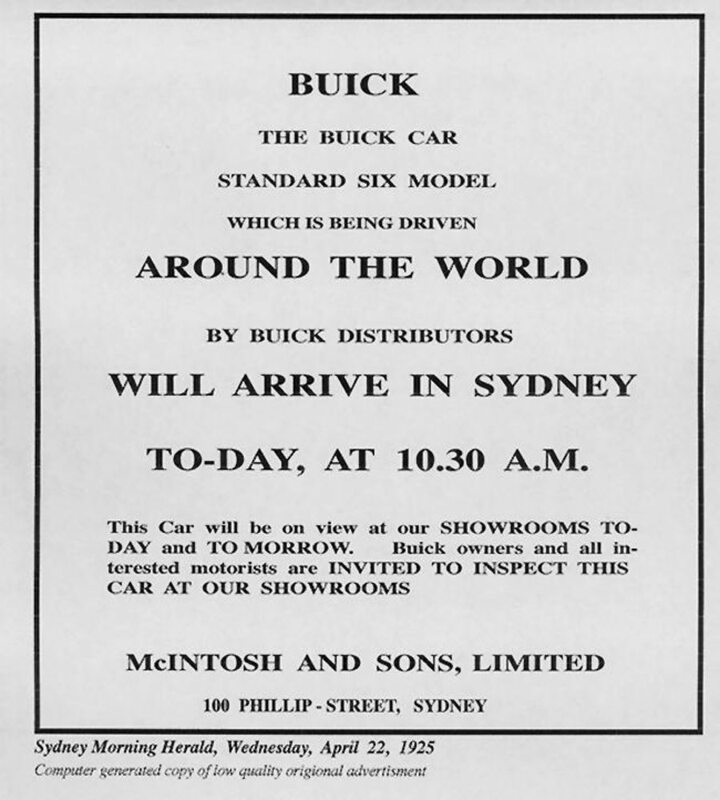 Buick Motor Corporation used this type of promotion extensively from the very early days, but their 1925, ?Buick Round the World? promotion must hail as the grandest and most successful of them all. The Buick marque was noted for its 4 cylinder economy models and large 6 cylinder upmarket cars. For the 1925 model year Buick took the bold step of dropping its very successful 4 cylinder economy line and replacing it with a slightly larger, light six car together with a fair price increase. This model ultimately became the stepping point for Buick?s volume selling range over the next decade. 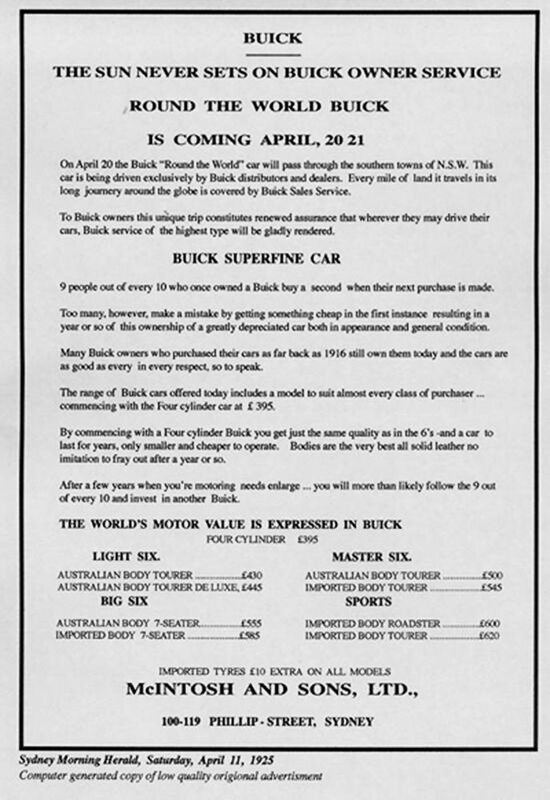 General Motors Export Company handled all Buick export sales so, together with Buick Motor Corporation, they devised a promotion whereby they would send one of the new light six Buicks, unaccompanied around the world via their world wide dealer network. The objectives would be to demonstrate the stamina and reliability of this new model and to illustrate to the international car buying market the extent, depth and efficiency of the world wide Buick dealer network. 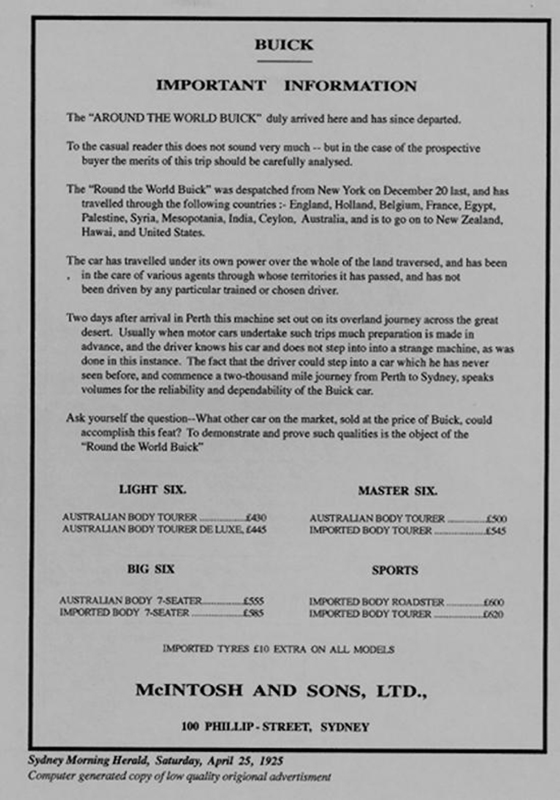 In order to make the feat more unusual, no driver or factory representative would travel with the vehicle. It would be simply handed on from dealer to dealer around the world with each dealer meeting the car on his territory boundary, driving it through his territory and handing it on to the next dealer at the other end of his territory. To add credence the car would carry a log book to be written up by the many participating drivers and passengers and endorsed at each stop with a witnessing signature by a local dignatory such as the mayor. The promotion took many months to arrange with the journey mapped out and planned ahead to a detailed schedule, times of arrival and departure in different towns and countries being set down in advance to coincide with required shipping schedules. To the planners credit the car was reported to run to timetable with all shipping arrangements met. The vehicle chosen was a 1925 Buick model 25-25X. This was the standard export model four door, light six, touring car with right hand drive. It was reported to be ex-factory standard production but was equipped with 4 spare wheels plus running board tool boxes to carry extra equipment such as shovels, chains, wire ropes and the like to assist in traversing some of the hostile terrain it would encounter. 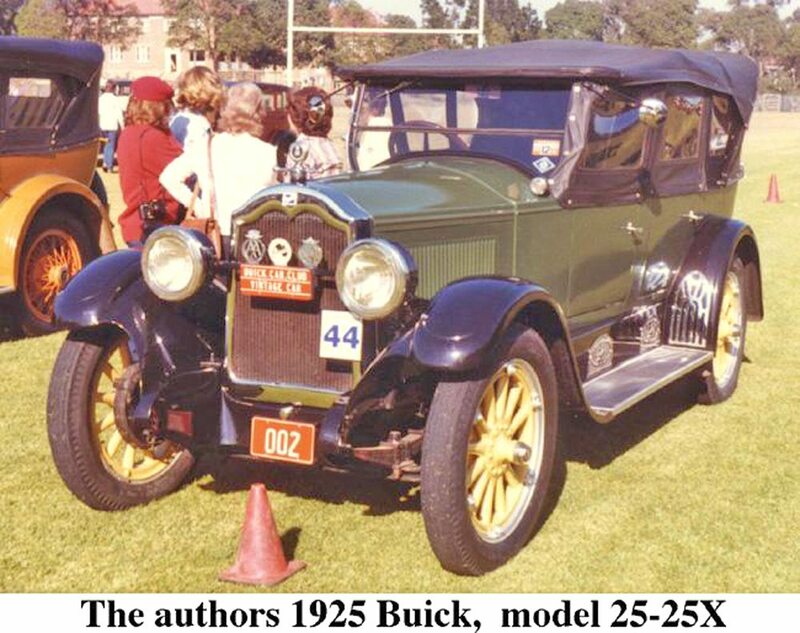 As it was the practice to launch the forth coming years models around August/September of the preceding year, it is no surprise to learn that this 1925 Buick promotion started in New York on December 20th, 1924 and after 16,499 miles finished in New York on June 23rd, 1925. 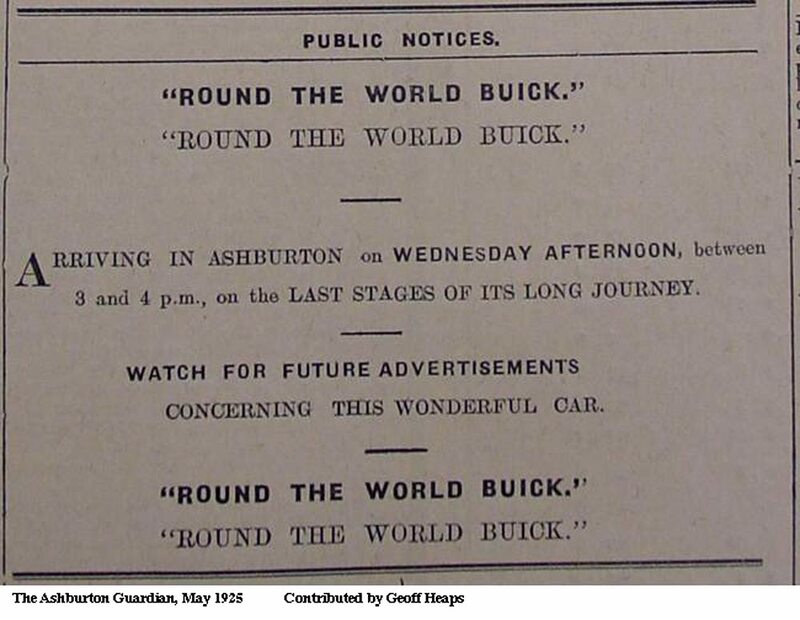 Shipped on board the SS Aurania to Liverpool, England the Buick was met by the British agents and driven via Manchester, Birmingham, Nottingham and Swindon to London. On January 6th, 1925 it left London by ship en route to Amsterdam, Holland, with the Netherlands Buick agents accepting delivery from the docks on January 8th. The Dutch then drove the car to Belgium via The Hague and Rotterdam to Brussels arriving on January 11th. The Belgium agents saw the car safely to Paris where the French agents took charge for the trip via Avignon to the Mediterranean port city of Marseilles. On board again the Buick left Europe on January 20th bound for Cairo, Egypt. Leaving Cairo the Buick travelled north to the coastal city of Port Said then on up the coast via Gaza to Jerusalem in Palestine. Continuing up the Mediterranean coast it arrived on February 5th at Beirut in Lebanon. Eastward from Beirut to Damascus, traveling through what was then known as Mesopatamina on to Bagdad, driver reports suggest the trip from Gaza to Bagdad over the Syrian desert as the roughest terrain encountered with the run over the Lebanon mountains recorded as extremely difficult. From Bagdad onward across Persia to Basrah on the west bank of the Euphrates. From this Persian Gulf port, the Buick was again on board, bound for India via the persian Gulf, the Gulf of Oman and across the Arabian Sea to Bombay. From Bombay the trans-India trip took the Buick north via Agra to Delhi arriving on March 1st, then southeast to the Bay of Bengal coast and Calcutta where on March 15th it was shipped to Colombo, Ceylon (today known as Sri Lanka). After being driven around the island, the Buick was again shipped, this time across the Indian Ocean to Western Australia. 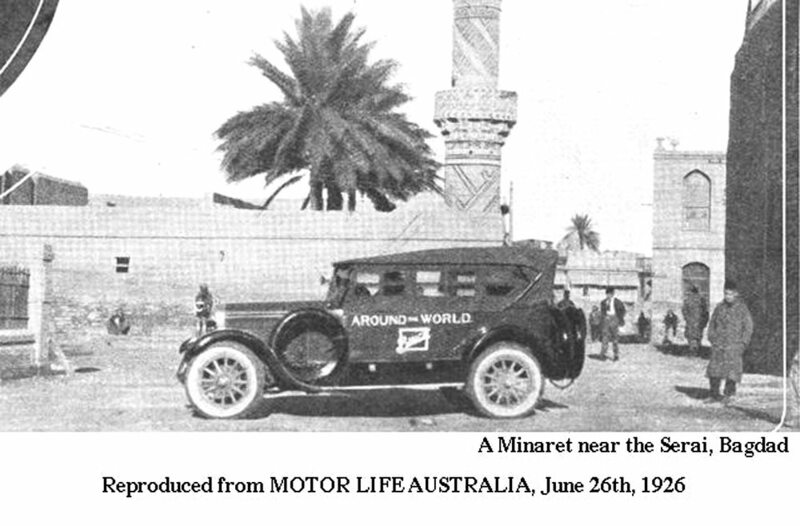 Arriving through the port of Fremantle, Dalgety & Company, the Western Australian Buick distributors took control of the car, displaying it in Perth on April 1st before embarking on the 1,800 plus mile trip across the Nullabour Plain to South Australia. 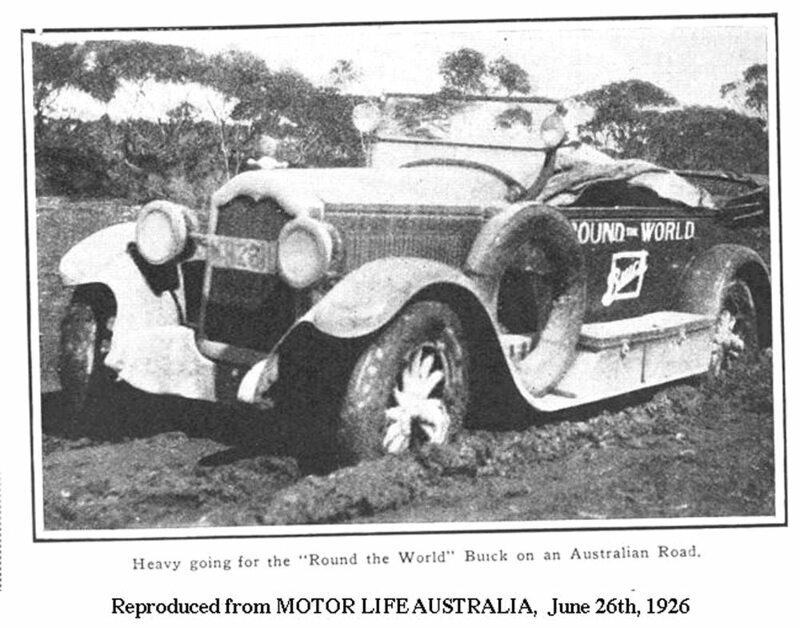 The trip to Adelaide was rough, taking seven days through mud so deep the Buick bogged to the axles (see picture). Mr E.G. Langdon was the driver who later declared he was thankful it was a Buick he was driving. 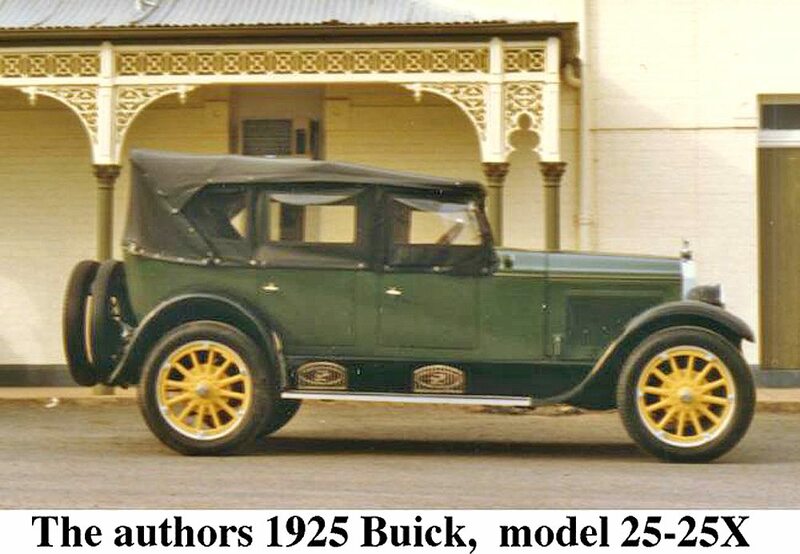 From Adelaide it took another four days to reach the Victorian capital Melbourne on April 15th, where the Victorian distributors, Lanes Motors Pty Ltd displayed the car, and then Mr R.T.Lane drove the Buick to Albury on the NSW border arriving on April 20th. At Albury Mr P.A. McIntosh accompanied by Mr Jack McManus from the New South Wales distributors McIntosh & Sons Ltd., took over the car for the trip to Sydney. “It was a fast drive and the car behaved excellently” said Mr McIntosh. “We had to stop in practically every town along the road from Albury to permit our agents and the public to inspect the car and that meant even harder driving than we cared for over very bad roads. Nevertheless, the car ran faultlessly and, in fact, it has only had one puncture since arriving in Australia. Four spare wheels are carried and as a precaution the tyres were changed in Adelaide.” On the trip from Albury to Sydney Mr McIntosh reported the Buick averaged 23 miles to the imperial gallon. After displaying the Buick in Sydney, it was shipped on April 24th across the Tasman Sea to New Zealand, arriving in Auckland on April 29th. From Auckland it travelled the east coast to Wellington via Gisborne, Napier and Woodville. From Wellington on board the steamer to the South Island, it disembarked at Lyttelton near Christchurch. The South Island dealers then embarking on a multi-stage trip down the east coast called on the way at Ashburton, Timaru, and Dunedin where a representative of Cooke Howlison & Co took charge. Driving on via Milton and Gore before reaching its southern most location in traveling around the world on May 4th, the Buick was in the hands of a representative of A.Russell & Co?s Garage, Invercargill. The following day, after parading through Invercargill and meeting with local dignitaries, the Buick set off to return to Wellington on the North Island via the same route, stopping on the way at Edendale for a photo with local Buick enthusiasts (see main photo). 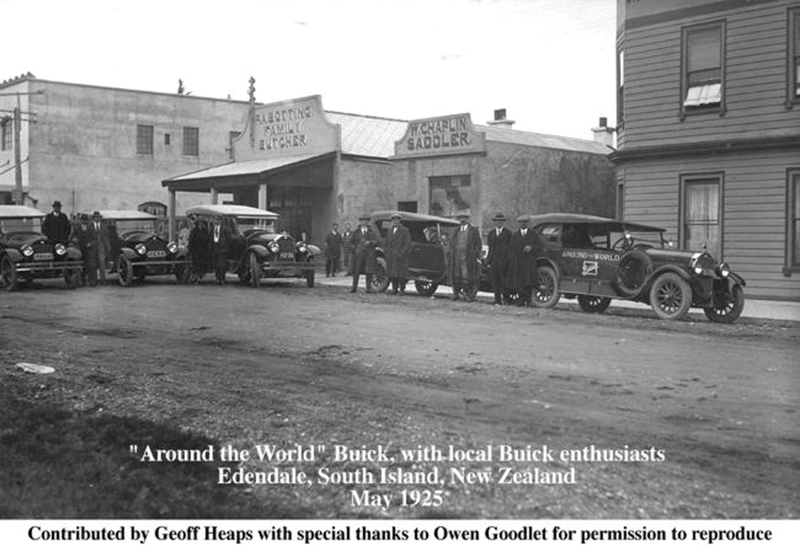 From Wellington via Wanganui and New Plymouth the Buick returned to Auckland completing its tour of New Zealand. On board again the Buick crossed the Pacific Ocean, briefly stopping at Honalulu, Hawaii to tour the island before eventually disembarking at San Francisco. From here many members of the American dealer network drove the car right across the United States calling in, on June 19th, at the Buick plant in Flint, Michigan where the car was made. From Flint to Detroit, the car crossed into Canada crossing back to the United States at Niagara Falls and then South to the finish, on time, at New York on June 25th, 1925. 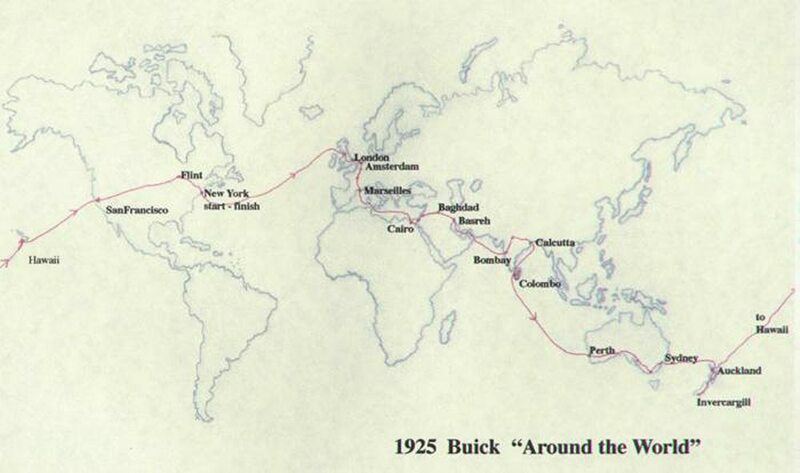 During this epic tour the nomadic Buick traversed 14 countries and travelled 16,499 miles and was driven by 90 representatives from the more than 600 strong, dealer network. Having read about this massive feat, take a minute to think about it in today?s terms. Like me, I am sure you will question if it would be possible to re-enact today. I think it would be unlikely. Series: Standard – 114 & 3/8″ wheelbase. Body: Tourer style, seats 5. Wheels 12 spoke artilery with demountable split rim, tyre size – 500 x 22″. Clutch Multi disc (10 plate dry). Rear axle 3/4 floating type with torque tube drive – ratio 4.9 to 1- track 56 & 3/8″. Steering 17 & 1/2″ ? wheel, worm and split nut semi irreversible type. Suspension Front – semi-elliptic, Rear – full floating cantilever. Brakes Service – 4 wheel, mechanical external contracting, 12 & 3/8″ ? drum. Hand – 2 wheel rear mechanical internal expanding, 12″ ? drum. Electrical 6 volt, Delco-Remy – motor generator 3 brush type. Fuel Tank 12 gal US, Stewart vacuum tank, Marvel updraft carburettor. By vintage standards it was a lovely car to drive and very reliable. Comparatively light on the steering, lively and responsive, she went almost anywhere in top gear. The seats were very comfortably but, despite the fuel consumption reported in the story above, the best I could squeeze from “Esmerelda” as we called her, was 16 miles per imperial gallon. The external contracting band brakes performed reasonably, that is provided you really didn’t want to stop quickly, except in wet weather when it was a question of no brakes whatsoever. The headlights were single filament (only one beam) and on a dark night the light beam could actually reach the road, but when you exceeded 35mph the car had a tendency to pass the headlamp illumination. “Essie” would cruise comfortably all day at 40 to 45mph (65 to 75kph) with four people on board, plus luggage. At 50mph you were thinking the engine was trying to climb out of the chassis and over 50mph you were sure it would. To get anywhere near the reported top speed of 65mph you needed to fold the top down and align the car with a very stiff tail wind. With a 4.9:1 diff. ratio the car was under geared, but this probably didn’t matter on the roads of 1925. On modern roads however, cruise performance and fuel consumption would benefit by a reduction in ratio of 2 or 3 points. One can’t help but have very fond memories of such a fine car which upheld and demonstrated the company saying, ”When better cars are built Buick will build them”. 2. Mired in the middle of an Australian highway, (bogged near to the axles in mud). 2. Outside Buckingham Palace in London, England.